The stunning Sea Cloud II, the last windjammer ever built on which guests can experience the sails actually being set and marvel at sailing manoeuvres performed by hand without any buttons being pushed will sail the Panama Canal for the first time in January 2012. Often referred to as the "Switzerland of South America" Costa Rica will be a special feature in two separate Sea Cloud II sailings as well as the UNESCO World Heritage Site of Granada in Nicaragua. 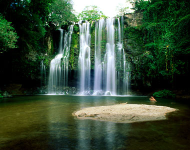 There are two round trip sailings departing from Puerto Caldera (San José) in Costa Rica on either the 16th or 23rd January 2012. Each cruise combines the experience of sailing along the Pacific coast with a variety of shore visits to the most beautiful National Parks of Costa Rica. Biologists, local guides and lecturers on board will unveil the wonder of Costa Rica's countryside to guests whilst they also enjoy the highest level of comfort that a luxury sailing ship has to offer. Rates for each seven night/eight day cruise commence from €2,995 per person for a guaranteed outside double cabin and include all excursions, six meals a day and personally selected wines and soft drinks. The Sea Cloud II was put into service in 2001 and is the younger sister of the legendary Sea Cloud, which was built 80 years ago for the American entrepreneurial married couple Edward Hutton and Marjorie Merriweather Post. On the main deck of the Sea Cloud the eight original cabins are still preserved in the luxurious style of the 1930′s. With only 32 cabins, 64 sailing enthusiasts and recreation seekers have the opportunity to sail to the most beautiful destinations in Europe, Central America and the Caribbean in an informal and relaxed atmosphere. The 47 cabins on the Sea Cloud II are furnished in a similar style and on board there is also a sauna and fitness area as well as massage treatments for relaxation. The fleet of Sea Cloud Cruises is rounded off by an elegant river yacht, the River Cloud II with 44 cabins, which traverses the most beautiful rivers in Europe between April and October.